One of the easiest and fun projects you can build! 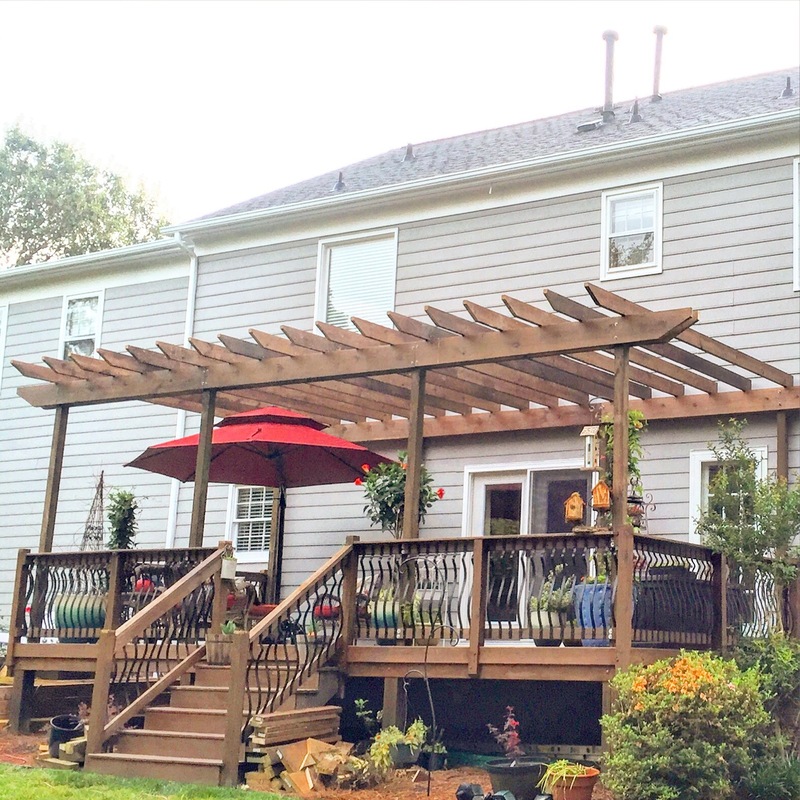 Typically a standard size pergola only requires 4 posts, 2 girders and rafters. That’s it. 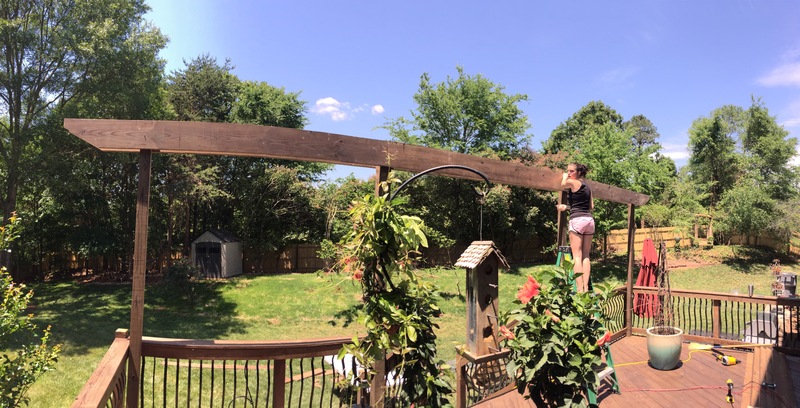 It’s just four posts and some boards, but a pergola must stand plumb, level and square through all kinds of weather. Kits (sam’s club pergola kit) – this is a great option for those that don’t have many tools and aren’t experienced with building. DIY treated lumber – my preference and choice. Local laws require setbacks from a property line to the edge of a structure. Check building codes; at least 4 feet is typical. Also verify the build with your HOA (if you have one) and contact the local authorities to see if a permit is necessary. Codes don’t specify spans for pergolas because they don’t support weight. I assume many of you will build a freestanding pergola in your backyard. I’ll give you a quick tutorial of a standard 12×12 (covered area) below. If you are connecting yours to a house or putting over a deck, message us for more details, these can get a little tricky depending on size of your deck, house layout and such. Draw up your plans – decide where you want it, is the ground level?, how big do we want it?, where is the sun rising and setting for shade purposes, etc. If you are working with unlevel ground, I suggest doing to ground prep to level out the area before building. Decide how much wood you need and go purchase it. I STRONGLY recommend staining your lumber in a garage or covered area BEFORE construction, this will save you a lot of headache. CALL BEFORE YOU DIG! – For the love of God, do not dig and electrocute yourself over a pergola. In NC, you can call 811 and the will be out within 72 hours to mark your utilities. Drive a stake(Lowe’s stakes) into the ground where the first post of the pergola will be placed. Measure from the stake to where the second post should be placed and drive the second stake into the ground. Repeat for the third and fourth stakes so you have a square or rectangular layout for your pergola. Dig your posts: I suggest renting an auger in NC if you have girly hands or you have tree roots, dry clay in your yard. If you want to do it the good ol’ manly way, grab your post holes diggers and start digging. Whichever way you choose, I suggest digging 3 ft deep, filling your holes with a little gravel for drainage, set your posts and pour your water and concrete into the holes and put the posts in accordingly. While setting your posts, grab a 4ft. level and make sure you are PLUMB on both sides. Let your posts sit for 24 hours, they will not be all level due to different dig depts, measure your shortest post, then take a saw (chainsaw works best for these large posts) and level them out to the shortest post. Mount your girders to the post with the help of a friend using screws at first and lining up the ends with the the 2 ft. marked lines you measured earlier. Next you want to carefully drill holes for your carriage bolts using at least a 10-12″ long bit with diameter slightly larger than your carriage bolts. 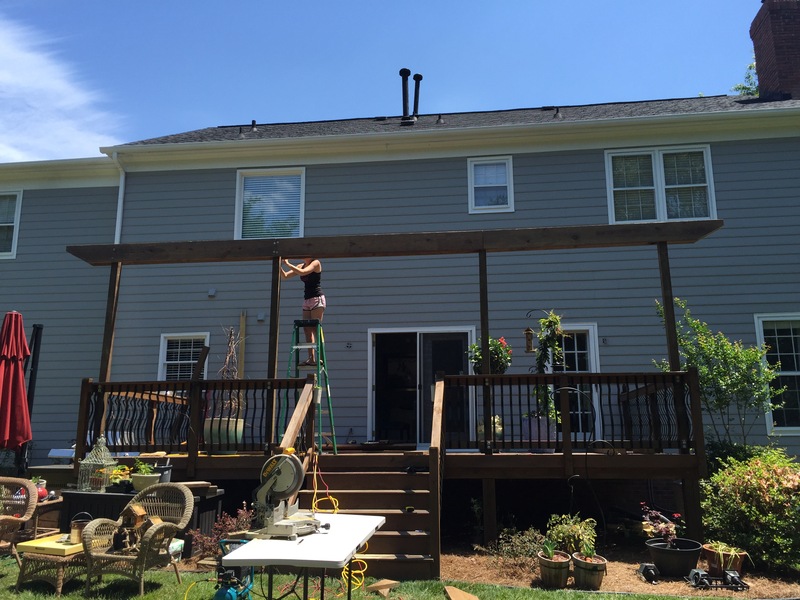 After you mount your girders on both sides of your pergola, you only have to mount your rafters! I chose to space mine 16″ on center starting from each end of the girder. You can cut notches to place on the girders or just angle nail them like I did using a nail gun. Make sure to cut your angle or design on each end before you begin! That’s it! It is optional but recommended to prevent warping and bowing of your rafters to mount some additional strips on top using a roof nailer or brad nailer. 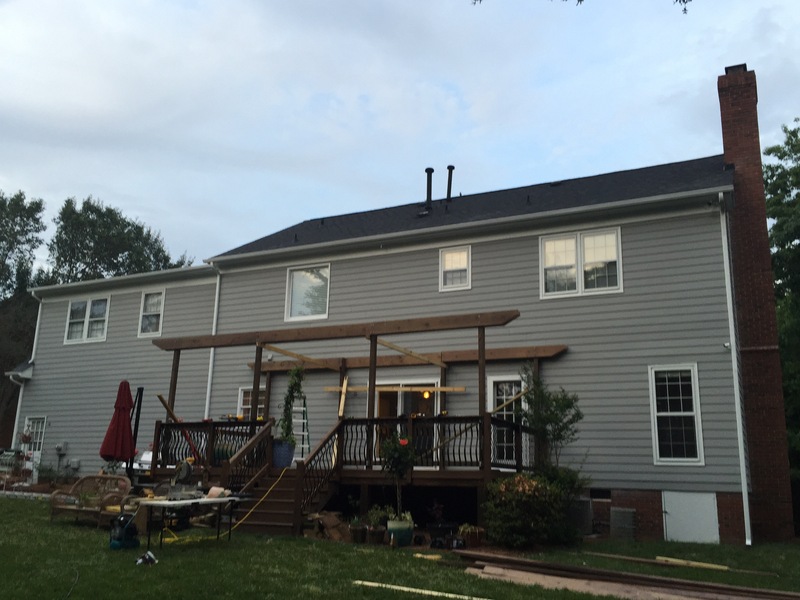 The final and most important step is to drink plenty of cold beers under your new pergola after completion. With any project, it is important to plan and walk through the project several times before you start. Take your time, plan accordingly, measure twice, cut once, and stop for the day when you are tired or frustrated. Below are some stages of our build. 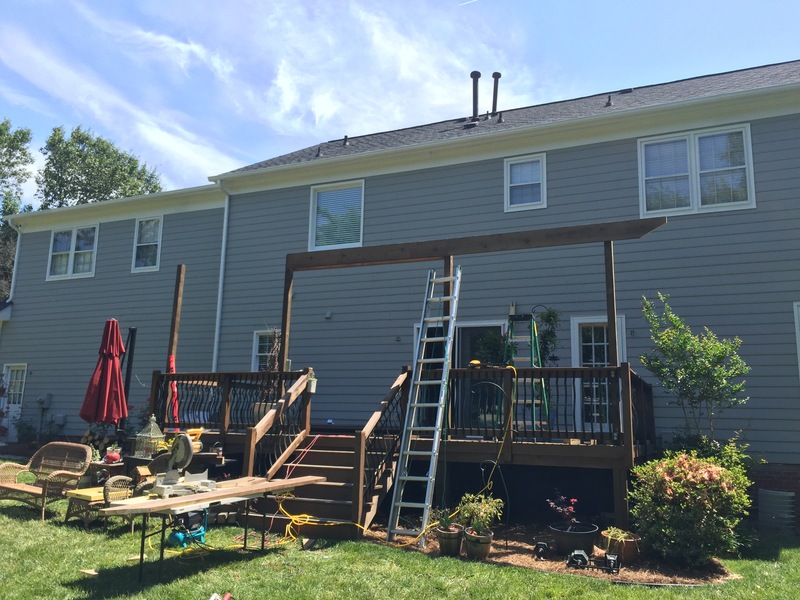 This was much more complex since we were building on an existing deck and it was 28 foot wide! Had to get creative with measurements and lumber but the finished product came out great! If anyone wants details on this one give us a shout. < Previous It’s Feedback Time & I Need Your Help! It looks great! I love how easy you guys make it seem, it’s really assessable when you break it down into steps/ cost/ where to get the supplies. Keep it up!